Whether you have cracked, faded, or overly worn concrete, Prestige Deck Coating, Inc. are experts at resurfacing concrete. We can restore nearly any cementitious integrated surface. We have a large variety of textures and colors to choose from. Our deck specialists can resurface your pool deck, patio deck, walkway, stairway, or driveway. Because pool deck concrete can get slippery and dangerous, try our slip resistant coatings. Resurfacing concrete will not only make your deck safe and helps to regulate the temperature on hot days, but adds aesthetic flair. Prestige is your complete resurfacing solution! As you can see below, there is a drastic difference between before and after! 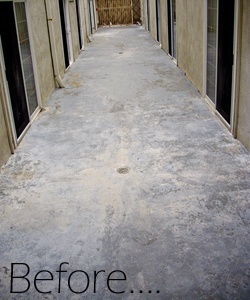 For us, resurfacing concrete is not simply an exercise in functionality. We believe a watertight surface need not be wedded to an ugly bride! Aesthetics are fundamental to humanity and thus we value the objective beauty as a complement to our resurfacing process. Call us today for a free and friendly estimate. We are excited to see how we can solve all of your decking needs. Our specialists have over well over 30 years of combined experience in deck resurfacing and concrete restoration. 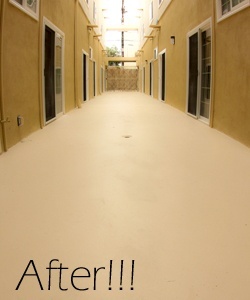 you can walk in style and safety after Prestige Deck Coating gets the job done! Call Today For A Free Consultation From Your Friendly Neighbor Resurfacing Concrete Contractor!